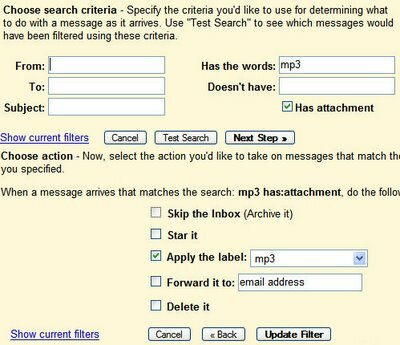 Gmail has a built-in player for MP3 attachments. If you receive emails that include MP3 files (maybe a podcast or a public domain recording), you can listen them directly from Gmail. This is feature was initially used only for the voicemails sent from Google Talk. Google uses a Flash player, similar to the one from Google Video. You can create a new filter for MP3 files, so it's easier to find them. You need to add a new label. It would be nice if it could play .wav files too as that is how Vonage sends out thier voicemails. Sending wav files is like including bmp files on a web page. It's too big and not necessary. For voicemail, an MP3 file encoded at 32kbit/s, 22KHz, mono is more appropriate. Google's voicemails have 24kbit/s, 11KHz, mono. Yes we all know MP3 is more efficient than WAV. However, that does not change the fact that Vonage sends their voicemails in WAV format. So, again, what we need is a player for WAV files too. I know MP3 is the best, small size than the WAV and very clear. But that doesn't mean that there are no other sound files types!! There are WMA and RM even if the real is the worst from the quality but it's the smallest and for that it's popular. You can send wav files (and any other multimedia format), but the maximum sive of the file must be 10 MB (or a little bit more; 12-13 MB). So you may want to split the file or use other way to send it. Has anybody hacked this into greasemonkey so that you get a little player next to WAV attachments? How do you upload an audio file to Blogger? I've read user groups & need it explained in simple, Kindergarten terms so that I can do it. Thanks from a New user. The ability to play wav files would definitely be useful. Many voicemail to email services use the .wav format. I'm looking for a way to play WAV files on GMail, too. Any news? Same here, I have vonage and they send wav files. It's a pain to download each like it was 1995! Create a label called "Playlist Summer 2009" and than set the gadget mp3 player to continuously play all songs labeled "Playlist Summer 2009"
It would of course come with the normal back, next, pause, play but you would only need to have one player open and have your music playing that is stored in your gmail account? I can't find this player. Is it a Flash program? If so, it would explain why it only plays MP3s. The Flash browser plugin will only play MP3, MPEG-MP4, Nellymoser and Speex (FLV) audio. It does not support WAV or AU or SND or any Windows Media (wmf) formats. A Silverlight-based plugin might work for Microsoft's formats. WAV files are sent by some ITSP's because they don't have to pay a royalty for encoding them in MP3, so suggesting providers change formats is probably not going to help here. The WAV script at userscripts.org works fine in firefox, but does not work in chrome. I look forward to the day when chrome will see a WAV file and play it within the browser via embedded player of some sort, whether by script or some other function. Still no news on this? MSN plays wavs directly in the email. I am about to try the conversion freebie thing. You set up filter to forward your messages, and you get them back with converted attachments. Same subject, body, etc. Kinda cool idea. We'll see how THAT works out. You would think Google would update GMail by now! Need to send wav file to recipients who can receive it. I can send but will they receive?